Racing Yacht Management (RYM) specializes in all the aspects of yacht management assisting owners in the general operations required to run racing and cruising yachts. RYM is based in Mill Valley, California and works with local, national and international clients. RYM has been involved with many racing campaigns over the past couple of years offering advice, coaching, sail inventory optimization, crew role development and branding as well as maintenance, the supply of goods and professional sailing. Owner Ashley Perrin is a racing sailor. Ashley has amassed over 80,000 ocean miles of racing and deliveries on many types of yachts IRC 46, Farr 40, J105, J120, GL70, Andrews 56, Moore 24, Etchells, 27M Jongert, Z86, IACC Yachts, RP70. 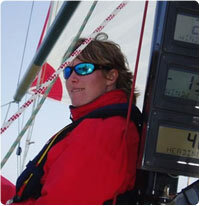 She has raced offshore since age 13, starting in the English Channel. With 5 Fastnets, 2 Transatlantics and 5 Pacific crossings and two Round Britain and Ireland races to her credit, racing has taken her all over the world. In 2006 she was onboard Lively Lady II the winner of the St David's Lighthouse Division in the 100th Newport Bermuda Race, she was also on the winning boat in the Rolex Transatlantic Race 2005 and the 2009 winner of the Caribbean 600 race. Ashley also holds her IYT Master of Yachts 200T license and annually updates her safety training. Ashley's back ground gives, her an in-depth knowledge of the industry and her time spent racing in local, national and international events gives her the experience to be able to advise and consult on any project at any level. Her hands on approach to previous campaigns gives Ashley an understanding of all aspects of yacht preparation and campaign management. Wiith many suppliers and links within the industry, she is able to cater to every need. We are ready to assist you, no job or boat is too big or too small.